In this post we are going to learn how to send sensor data to Thingspeak IoT platform using ESP8266 and Arduino. In the previous tutorial we saw how to send data to thingspeak using GSM modem and Arduino which didn’t need a Wi-Fi hotspot. In this post we will learn how to connect your Arduino project to Wi-Fi and observe data in real time on Thingspeak. Quick overview: What we are going to do? What is ESP8266 Wi-Fi Module? What is Thingspeak platform, how to create an account and get API key? How to upload code to ESP8266? How to install ESP8266 board package to Arduino IDE? Circuit connection for ESP8266 to Arduino. Possible errors while uploading code to ESP8266 and solution. Final circuit diagram for sending temperature and humidity data to thingspeak. We are going to send temperature and humidity data to thingspeak using DHT11, ESP8266 module and Arduino board. 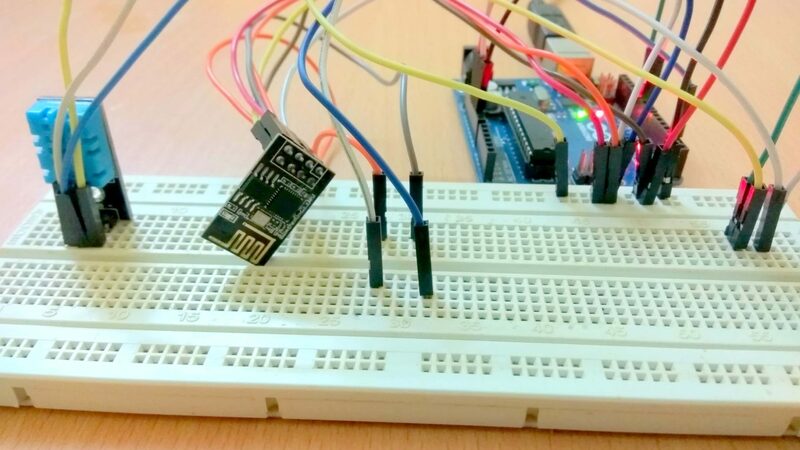 We will learn how to upload program code to ESP8266 module; the uploaded program code on ESP8266 will accept serial data from Arduino which will be forwarded to Thingspeak platform via Wi-Fi connection. 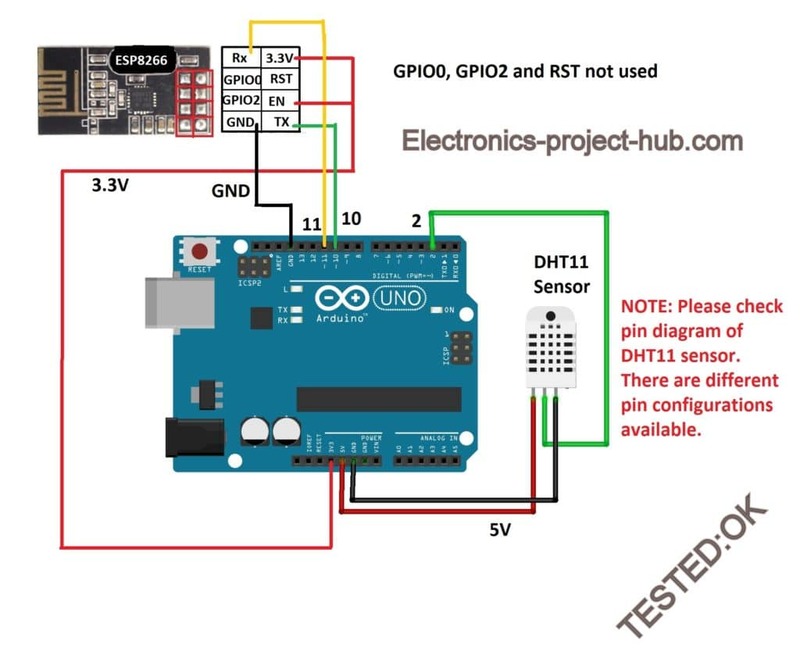 The Arduino board will collect temperature and humidity data from DHT11 sensor and will be sent serially to ESP8266 module. 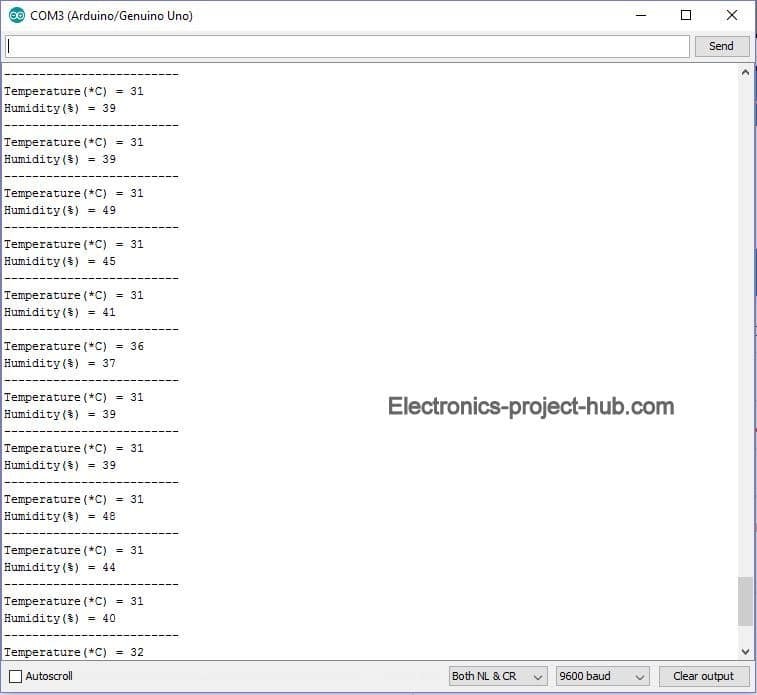 We are uploading two sets of program code: one for Arduino and another for ESP8266 module. 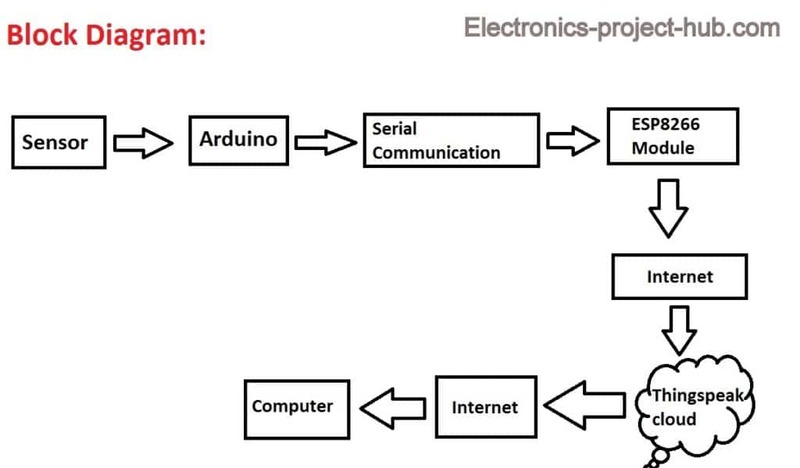 We will be utilizing the same Arduino board to upload program code to ESP8266. 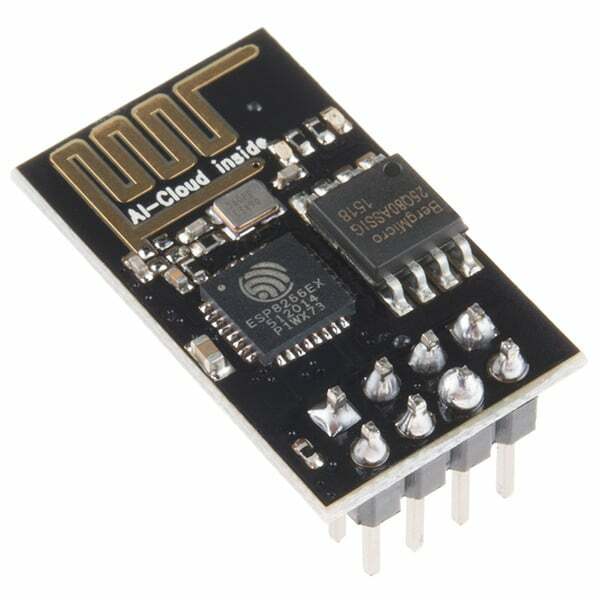 ESP8266 module is a microcontroller board with Wi-Fi capability which is designed to operate as standalone application or act as slave device that is connected to a microcontroller (master) to enable internet connection wirelessly for the intended project. Beginners might think that ESP8266 module as a slave device and always need a microcontroller to operate, but that is not true. The ESP8266 can operate as standalone device; it has its own 32-bit microcontroller clocked at 80MHz and flash memory which can be programmed using Arduino IDE. But this module has only two GPIO pins which will limit our number of sensor and peripherals which we are going to connect. 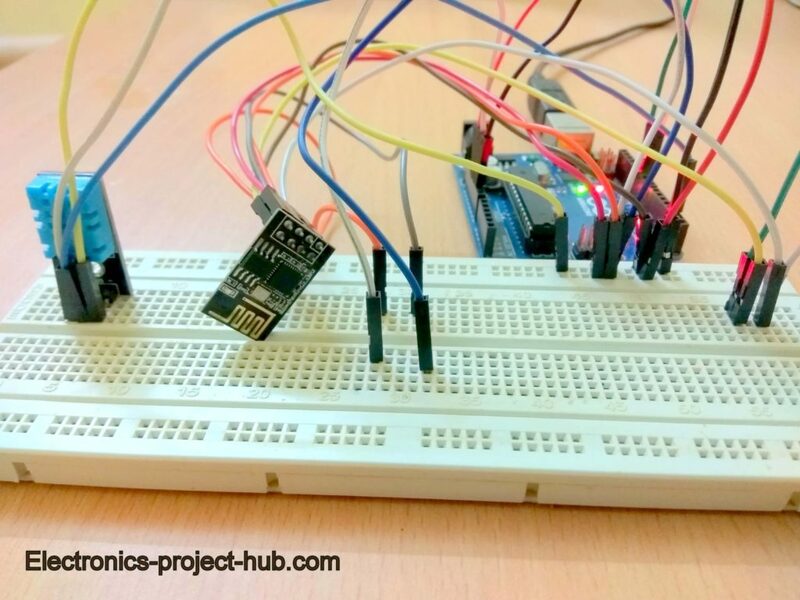 If you are going to use only one sensor (connected to a single pin) then you may not need any microcontroller, you can directly add the library (if necessary) and write code as you do for arduino boards and upload it to ESP8266 module. As we need more than two pins, we are using ESP8266 as slave device; this is done by uploading a program code to ESP8266 which will accept serial data from arduino. We will see how to upload code to ESP8266 using Arduino Uno board in detail later in the article. Now let’s take a look at its specifications of ESP8266. ESP8266 module has its own SoC or system on chip and flash memory etc. It utilizes Tensilica L106 32-bit processor clocked at 80MHz. It has 32KB instruction RAM, 32KB instruction cache RAM, 80KB user data RAM and 16 KBETS system data RAM. It can operate from 2.5V to 3.6V (nominal 3.3V) and 5V will kill the board. It has average current consumption about 80mA. It supports 802.11n (2.4 GHz) and can communicate up to 72.2 Mbps. It supports these network protocols: IPv4, TCP/UDP/HTTP. The pin diagram is also printed on the back of the ESP8266 module, which makes our tasks much easier. By now you would have got a small idea on ESP8266 module and you may have understood that we have to upload a program code to ESP8266 to make it operational either as standalone or as slave device. Now we have to send some data to a server so that we can view the sent data anywhere in the world, which is the objective of this tutorial. We have chosen Thingspeak IoT platform for sending and retrieving the data. If you intentionally landed this post, there is a good chance that you may already know what thingspeak platform is and you may already have an account and API key. If you are just exploring these things for the first time please click here and read the following topics in the post. What is Thingspeak IoT analytics Platform? Please follow channel setting instruction and replicate to your account as we are going to do the same here as in the mentioned tutorial. As we mentioned at the beginning of the tutorial ESP8266 is a microcontroller board with Wi-Fi capability and we need to upload some program code to make it functional. So now we are going upload a program code which is written on Arduino IDE and we are going to use Arduino Uno board’s build-in programmer to upload the code to ESP8266 by doing which the ESP8266 will accept serial data which will be sent to Thingspeak. You need to wire up the circuit as per the above schematic, you will need 2 push buttons and don’t forget to remove the ATmega328P from the board. Double check the supply to ESP8266 as it operates on 3.3V and 5V will kill the board. 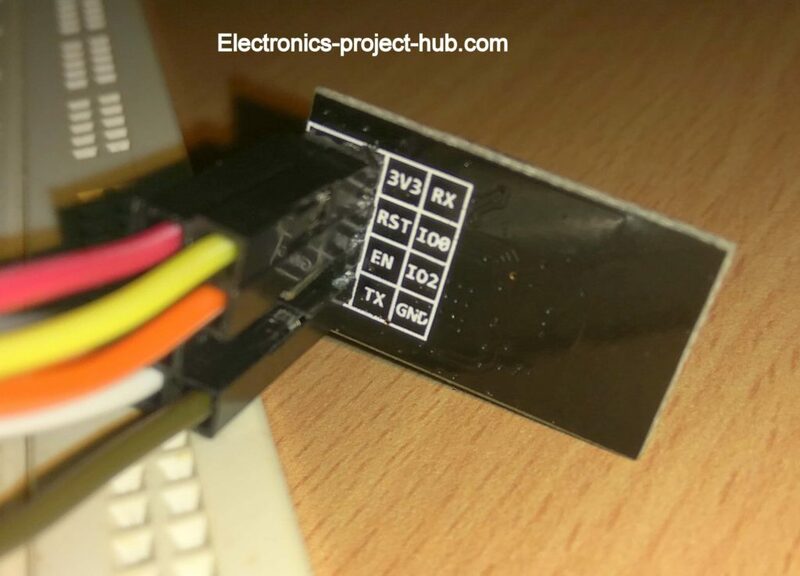 The ESP8266 will get slightly warm after connecting to the supply which is normal but, if it gets very hot then you probably messed with wire connections/supply voltage and it may already got damaged even before you realize. Once the hardware is ready we need to install the ESP8266 board package, now let’s see how to do that. 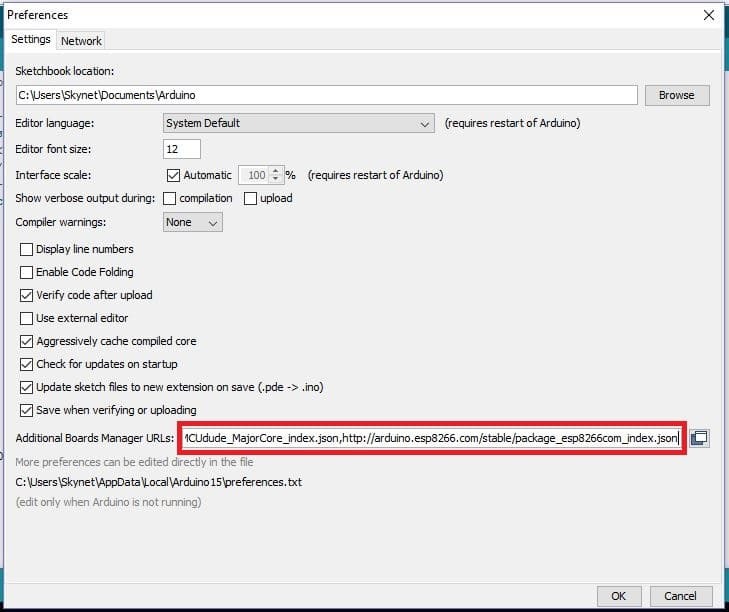 We will tell you the function the 2 buttons once the board package is installed to your IDE. This package will make the Arduino IDE compatible with ESP8266 module. Now open Arduino IDE and click on “File” > “Preferences”. Paste the URL on the box and click “OK”. Now go to tools > Board > Boards Manager, which is at top of all options. 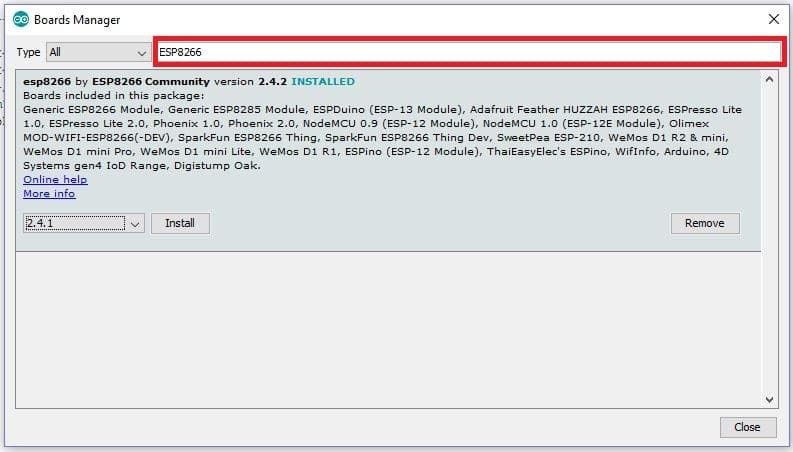 Type ESP8266 on the box as shown and you will get an installation option, select the latest version and click install. Now the IDE will download the necessary package and this will take more than 5 minute to complete. Now go to Tools > Board > select “Generic ESP8266 Module” and you are done. Now copy the ESP8266 program code given below and paste it on the IDE change the SSID and Password in code with of your home’s Wi-Fi or create a mobile hotspot from your smartphone. Copy the “write API key” from your thingspeak account and paste it on the code. Now press compile button (Green tick button). The compilation of code may take more than couple of minutes so be patient. If compilation failed please check that you have selected the “Generic ESP8266 Module” in the board option. 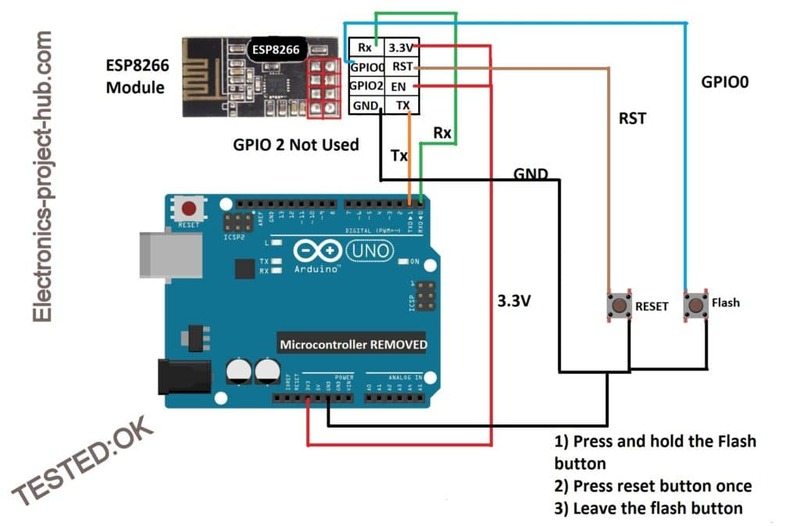 After the successful compilation of the code, connect the Arduino to your PC and go to “Tools” > “Port” and make sure that Arduino Uno is selected or the correct COM port. Now Press and hold the FLASH button and press the RESET button once and leave the FLASH button. By doing this ESP8266 will know that a new program is going to upload to its memory. Now click the upload button (Green arrow button), the code starts to compile again (it takes 2 minutes) and uploading to ESP8266 will also take another 2 minutes, again be patient. The orange coloured text is not error or warning, the uploading progress bar will not be similar to what see while uploading a code to the Arduino Uno board. Now the code is successfully uploaded to ESP8266 Module and now will accept the data serially. If you see this error message in your IDE, the code did not get uploaded. You did not press the flash and reset button in the correct order. You did not connect the TX and RX terminals properly. Remember the Tx should go to Tx and Rx should go to Rx and not any other way. Also check all the wire connections. The board is damaged because you applied 5V to the board mistakenly before, the only possible solution is to replace the ESP8266 module. If your code did not compile successfully in the first place, you did not select the correct board. Go to Tools > Board > select “Generic ESP8266 Module”. The code will accept data if it finds “*” and “#” in the incoming serial. “*” is the start character and “#” is the end character. The below code accepts 4 integer data after the “*” and stop accepting after the “#”. The incoming data should be like this *2345# here, 23 is temperature and 45 is humidity. You can open serial monitor with the same setup and enter *2345#, Thingspeak will plot graph at 23 on temperature graph and 45 at humidity graph. Please note that only four digits will accepted in between * and # with the above code and no decimal point should be send. Please note that after “*” there should be precisely 6 digits (no less or no more) otherwise data won’t be sent. The above circuit is self-explanatory, just wire up as per the above circuit diagram. Please double check Vcc to ESP8266 it must be 3.3V and 5V will kill the module. 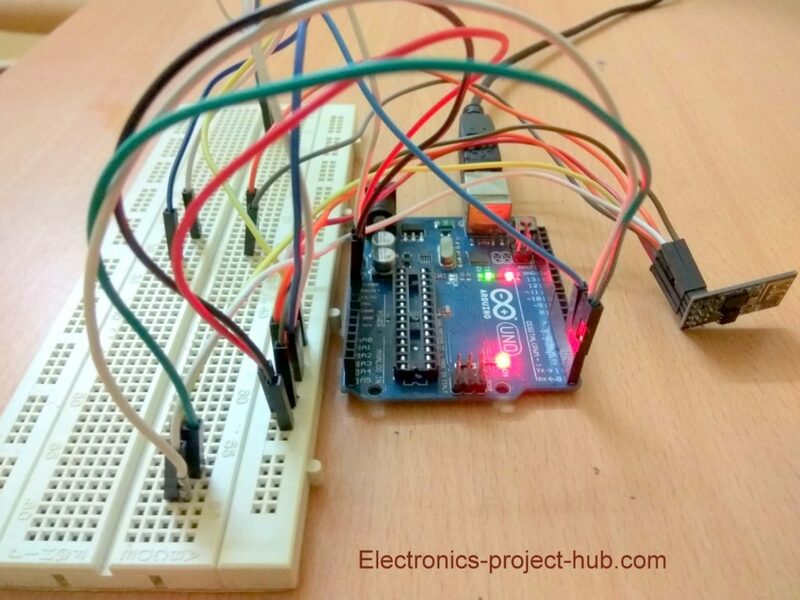 Upload the above code to Arduino Uno board after inserting ATmega328P to the board. Don’t forget to select the board back to Arduino Uno in the Tools> boards> Arduino Uno, otherwise you will get compilation error. If you have any question regarding this project, feel free to ask us. You can anticipate a guaranteed reply from us. nodemcu driver link(usb to uart bridge). This is need first to use nodemcu. can i know how to send data to oracle database’s table. like my humidity and temperature values must go to respective columns of the table in oracle database(or mysql or postgresql). We have API readily available for that purpose, we must only know how to insert data into columns of our table in database using API( a link) and has SQL command(to insert data into database) in the string variable. From nodemcu. I have no experience on how to send data to oracle database (I think its proprietary of your company). But my assumption is that it should be similar to what shown in this article, instead of ESP8266 module you have used nodeMCU. My suggestion is first try to build a simple project using thingspeak with nodeMCUand try to send data, after that replace the necessary fields with your API etc etc.. If possible I will try to make project using nodeMCU and thingspeak near future. Please which library did you use for #include ? That’s a build in library / from the package that you need to download (explained in this post ) to make the IDE work with ESP8266. Thanks for your quick response. I have downloaded it but it’s not working. It’s like capital letter and small letter (DHT and dht). That’s where the problem lies. Please can you send me the link to the library. I’m finding it difficult and this is my final year project. Please help me as much as you could i’m new to this, and just learning. could you please in box me or text me your e-mail. I’ve a similar question. You can ask your question here, many readers might have that same questions that you may have. Delete any existing library of DHT, there are different variants available on the internet, I am using this one. Just delete the existing DHT library and add this one, your problem will be solved! The program code is written for the library mentioned in the post. You need to modified a lot in the code, including the data format that your are send to ESP8266. If possible we will try to update with ultrasonic sensor in near future. I will update an easy method to send data without any sensor, by sending integer and floating numbers, very soon.